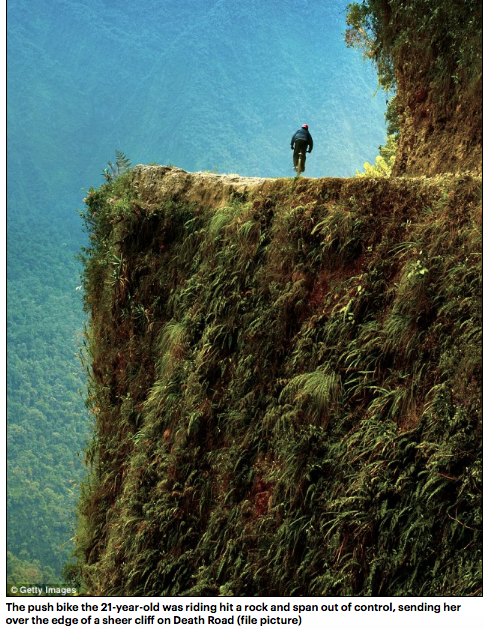 A cyclist plunged off a 300ft cliff along a route so dangerous it has been dubbed Death Road – only to survive after landing on a tiny ledge. 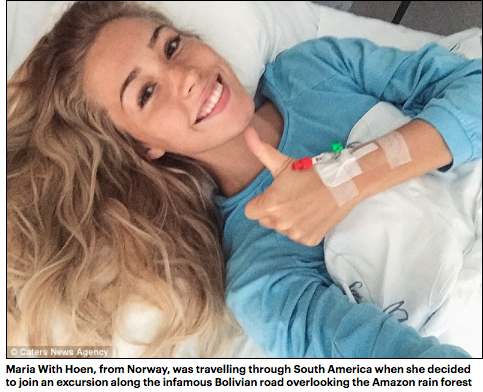 Maria With Hoen, from Norway, was travelling through South America when she decided to join an excursion along the infamous Bolivian road overlooking the Amazon rain forest. 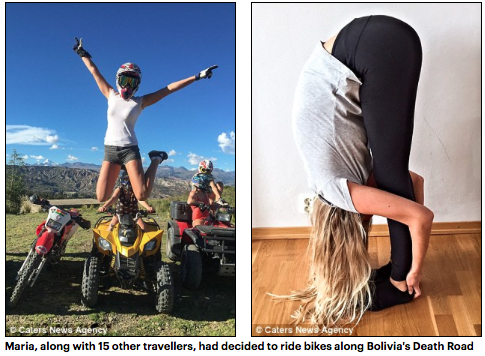 But the push bike the 21-year-old was riding hit a rock and span out of control, sending her over the edge of a sheer cliff. 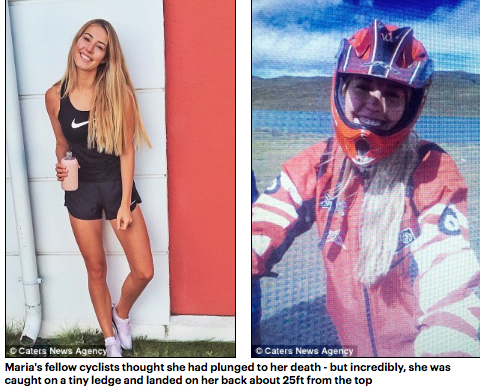 Her fellow cyclists thought she had plunged to her death – but incredibly, she was caught on a tiny ledge and landed on her back about 25ft from the top. She was rushed to hospital where doctors told her she had broken her back and was taken down to surgery before paralysis set in. Surgeons were able to reconstruct her spine, but due to her injuries Maria was left unable to move by herself for months. After two years with intense physical therapy, and a further two operations and the removal of her spinal fusion, Maria is starting to make her recovery. She said: ‘It was a miracle I survived the fall, when I went over the edge all I could see was the huge drop straight to the bottom and I had accepted I was going to die. ‘When I lost control of my bike I flew straight off the edge, but not only was I lucky to be caught by the ledge, but also to land on my back and not my neck which would have paralysed me completely, I was conscious the entire time. ‘I remember that the fear of dying was nothing compared to the joy of surviving, although that was quickly overshadowed by the stabbing pain in my back. ‘I was rushed to hospital, and at that point I started to lose function in my legs, the closer we got to the hospital the less I could feel, I was in complete shock. 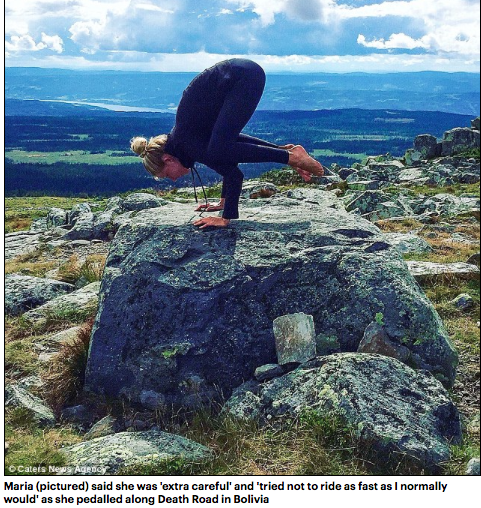 ‘After breaking my back doctors were unsure of whether I’d ever fully recover, which was terrifying. ‘But after intense therapy and a lot of patience and determination I am finally getting there, my body is getting stronger and my back is finally strong enough to support itself again. ‘I tried running for the first time a few days ago which felt amazing, and I have even been skiing three times since December. 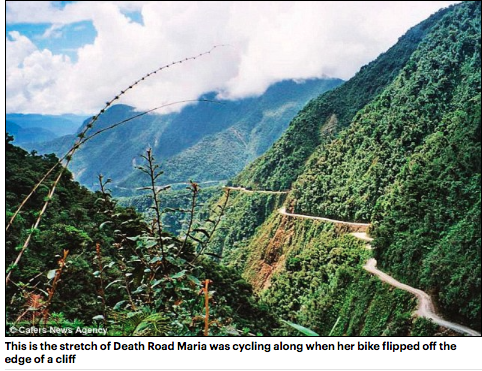 In March 2015, Maria, along with 15 other travellers, decided to ride bikes along Bolivia’s Death Road. 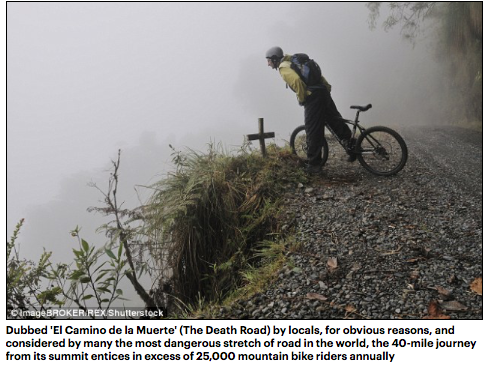 Dubbed ‘El Camino de la Muerte’ by locals, and considered by many the most dangerous stretch of road in the world, the 40-mile journey from its summit entices in excess of 25,000 mountain bike riders annually. 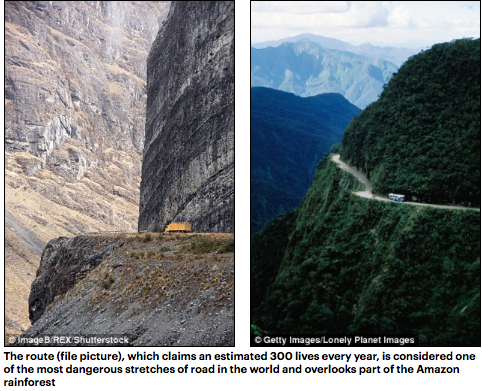 She added: ‘Due to a landslide blocking the main road in the area, there were cars allowed on Death Road that day. ‘The road is very narrow, and we were actually instructed to keep to the left side close to the edge, so the cars could pass us on the inside. ‘Because of this I was being extra careful and tried not to ride as fast as I normally would. ‘I saw a turn up ahead of me and was focused on thinking that there could be a car coming, but in that second my back wheel must have hit a rock, and it spun out of control. ‘I went straight over the edge of the cliff and when I landed I had to scream for help as I couldn’t be seen from the road. 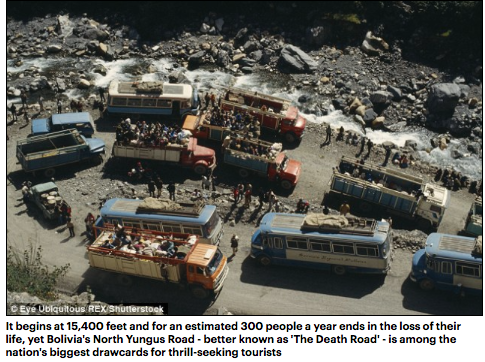 ‘The tour guides lowered themselves and a stretcher down using ropes and pulled me back up the edge off the cliff. 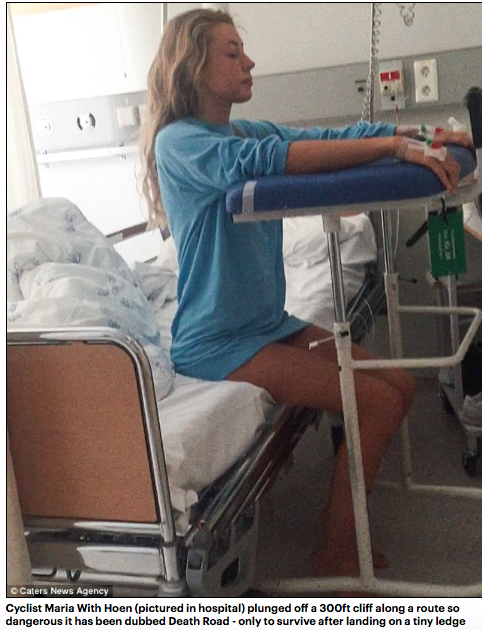 ‘When I got to the hospital they told me I had burst fractures and I had to have surgery straight away before I became paralysed. ‘Surgeons had to reconstruct my vertebrae as they were crushed to pieces, but thankfully the seven hour surgery was a success. Maria was making good progress, but over the next two months she started to feel severe pain and a decrease of function in her left side as one of the metal screws in her back had started to press into her nerves. 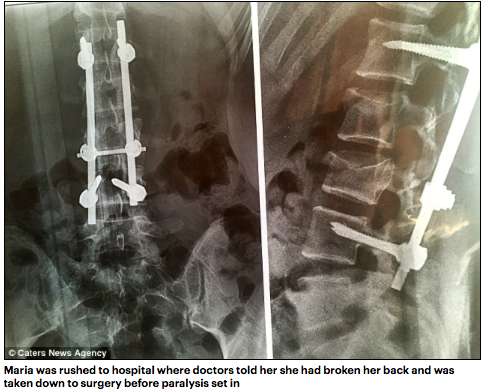 She added: ‘The pain was excruciating, way more so than the fracturing itself, which I didn’t think possible at the time and I had to have further spinal surgery to get the left side of the fusion replaced. ‘Recovering from this has been the hardest part for me, as there was damage to the tissues as well as the nerves. ‘I couldn’t walk or sit properly for a further two months and I couldn’t even go to the bathroom by myself. 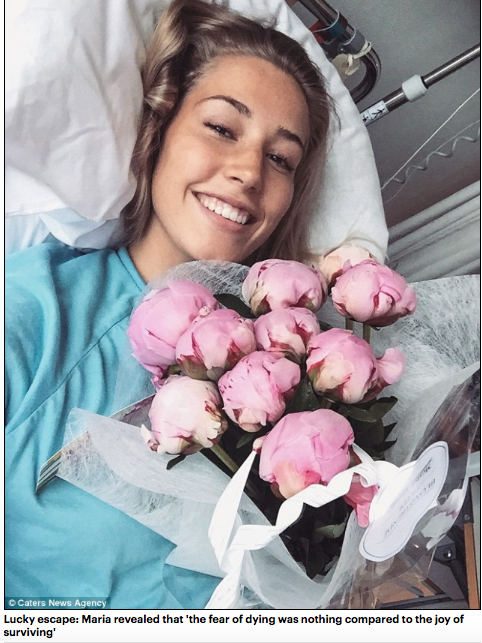 ‘My recovery hasn’t been easy, but I had my spinal fusion removed in June last year which has really helped speed up my recovery. ‘The reconstruction and healing of my spine has been a success and it’s now strong enough to hold me up without any support. ‘I still have regular physical therapy and treatments, Yoga and stretching has helped to get me moving again and meditation has helped me find acceptance and joy in the situation. ‘In many ways I am grateful for what has happened to me, as it has has taught me so much about myself and what I want from life. ‘As I fell off that road I was devastated to realise how much time and energy I had wasted on obsessing over little things and not feeling good enough, I was always looking to achieve and become something more than I already was. 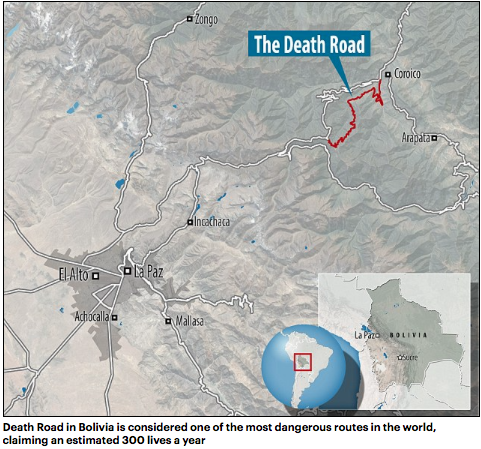 This entry was posted in Bolivia, Environment, Health, La Paz, Tourism and tagged accident, adventure, roads, Yungas in La Paz. Bookmark the permalink.